You got me curious so I went and looked. Get 'em while they're hot folks!! Drawing directly on the "piccher chube" was prolly my parents main concern when they took my Winky dink kit away....an original kit (in the box) would most likely fetch a high price on E-Bay these days. I wonder how many kids by-passed the plastic film and drew directly on the TV screen. I'll be 65 next month...my mom & dad took the kit away from me shortly after I opened it...they said "You're NOT drawing on ANY TV screen!!! "...when we moved to Wayne NJ from Fort Lee, NJ in 1961, the old kit/game was still in the attic along with a buncha other toys the folks took away from us on the premise that they were either too fragile, too childish or 'dangerous (to them)...my late brother, Tim, never forgave them 'til they day he died...there was some really cool sh*t up there!!! I am 66 years old and had a kit and there was no color to the film provided. However there was another item (screen) you could get tha had blue at top and green at bottom. I guess red in between. anyway, when winky got into trouble we could draw a ladder etc to help him out. 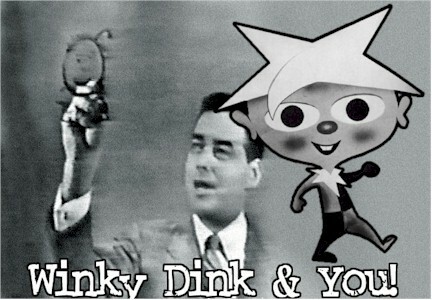 love winky dink. WINKY DINK...kinda an answer to Learn to Draw with John Nagy...when I was mebbe 5 or 6 I got a Winky Dink coloring kit...you could turn your B&W TV into "color" TV...you then drew on the picture tube....Mom & dad took my kit away from me..."You're NOT drawing on OUR TV!!!"